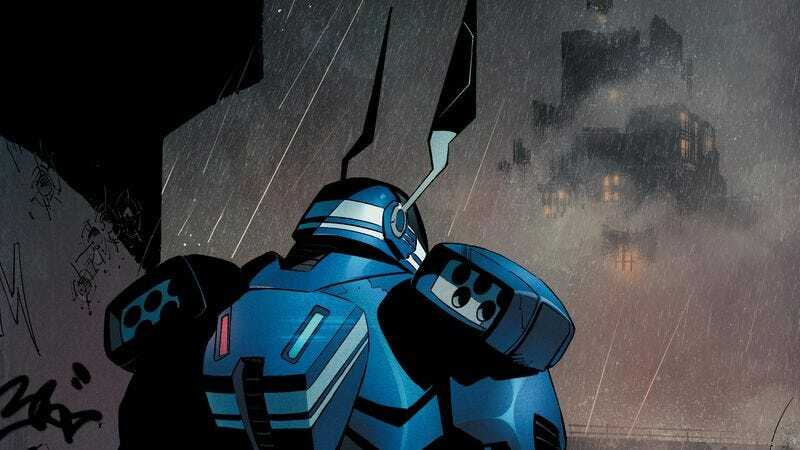 Jim Gordon as a mech-suit-wearing Batman officially sanctioned by the Gotham City Police Department is the kind of idea that probably started off as a joke in a development meeting. Gordon is the main character on a network TV series, so how can he have a bigger part in the Batman comics? Why not throw him in a suit of armor and have him patrol Gotham’s streets as a new Batman? Everyone in the room laughs, and then they fall silent as they realize that actually sounds pretty fun, and now it’s the new Batman status quo. Writer Scott Snyder and the art team of penciller Greg Capullo, inker Danny Miki, and colorist FCO Plascencia have used Jim Gordon to take Batman (DC) in a refreshing new direction, exploring the idea behind Gotham’s Dark Knight from the perspective of a man who doesn’t have the same tortured relationship to Batman that Bruce Wayne does. This team’s Batman run was largely governed by horror and suspense before the shift from Wayne to Gordon, but the last two issues (#41 and #42) have replaced those elements with a thrilling sense of wonder as Gordon adjusts to being the Bat and learns how to be a superhero instead of a cop. It’s led to a considerably less grim approach from this creative team, one that plays more like a blockbuster action movie rather than a superhero horror story. Capullo continues to provide some of the most kinetic art at DC Comics with his pencils on Batman, taking advantage of the tonal shift in Snyder’s story to deliver explosive superhero action that is far from Bruce Wayne’s more stealthy fighting style as Batman. Miki’s inks accentuate the fine details in Capullo’s linework, and it’s astounding how meticulously rendered this team’s Gotham City is, even when shown from hundreds of feet in the air. Batman’s life is split between street-level detective work and fantastic fisticuffs, and Plascencia’s color palette changes considerably depending on what mode the hero is in. When Gordon is investigating a dead body at the morgue, the coloring is very subdued and dominated by gray, but when he jumps into action, there’s a rush of neon shades that make everything more vibrant and dynamic. After a nearly five month wait, Annihilator #6 (Legendary) picks up precisely where #5 left off, with our protagonist Ray Spass in mortal danger from both internal and external forces. After five issues of Spass being hauled around by his nose, #6 promises by sheer dint of being the last issue to finally wrap things up. The strength of this book is Frazer Irving’s art. Irving is an astonishing artist with an awesome imagination, just the sort of person you want working on a space opera that wallows in introspection. He has an excellent eye for facial expressions and knows just how to enhance dialogue with body language. Every single page is an exploration of light and shadow and motion, panels framed like shots from spaghetti Westerns. The layout and explosive light keep the tension and anticipation high, despite the monochromatic color palettes that Irving works with. Using mostly rich magentas and deep midnight blues, Irving gives Annihilator the sense of grandeur and madness it absolutely needs. Characters are often lit from below or behind, leaving their faces stark and contorted like children telling ghost stories with flashlights under their chins; appropriate, given that Grant Morrison is telling a ghost story both cosmic and intimately deluded. Several months ago an issue of one of Morrison’s other titles, Nameless, and Annihilator both made similar, rather specific, references to 9/11. There was, very briefly, the temptation to hope that Morrison had managed to write a publisher-spanning saga, a time- and/or dimension-hopping story about the power of belief. After all, it doesn’t take a particularly large leap to see the similarities between a protagonist named Max Nomax and one called, literally, Nameless, both of them encountering some sort of horrific monster on a distant space station. Unfortunately this wasn’t the case, and Nameless is the stronger of the two stories. Perhaps it’s because of the long wait or because Legendary doesn’t have the same editorial experience as more established publishers, but Annihilator #6 falls flatter even than those before it. The first issue, probably the best of the six, introduced both Spass and Nomax, as well as the question of if the former created the latter or was merely a conduit to tell his story to the masses. The concept was intriguing and felt fresh, though variations of the story have been told before. The subsequent four issues served to make both Spass and Nomax seem even more unsympathetic, though they were given opportunities to become, if not heroes, at least protagonists worth reading about. This final issue only seals the deal, with both of them confronted by the women they claim to love, taken to task for years of abuse and narcissism that they still cannot seem to recognize as the root of their respective problems. Educational comics are an undersung and yet vitally important corner of the medium. Because of their economy of expression, a comic can effectively communicate difficult instructions in a concise manner. There’s a reason why the explosive decompression instructions on the laminated card in the seat-back on the airplane are given in pictographic form. It has to do with the fact that anyone can read those cartoons, whether they can read English, or have forgotten their reading glasses, or are drunk on those tiny bottles of champagne that cost way too much money. Kate Leth’s new mini Ink For Beginners: A Comic Guide To Getting Tattooed (Retrofit / Big Planet) is an utterly charming entry to the canon of eccentric educational comics, tackling an occasionally contentious topic in a broadly appealing way. Leth has had a good few years, between writing numerous Adventure Time and Bravest Warriors issues for Boom!’s kids’ comic division, as well as IDW’s Edward Scissorhands revival, and too many webcomics to count. This project is obviously a one-off, intended for a different audience than Adventure Time (although maybe not that much different), and yet it is a fascinating object, a tiny pamphlet of magnetic adorability regardless of what your actual opinion on tattooing might be. Even though this is ostensibly a how-to guide, it serves another purpose—offering an answer to the questions of not just “how” to get tattooed, but to the “why” as well. Leth is an experienced tattoo-ee, with ample negative as well as positive experiences to draw from. “This comic is not here to judge you for what you’re having inked,” she says, before adding, “that’s your biz” (much as you imagine Finn might say). The question she asks is simple: “Are ya sure?” She spends the rest of the pamphlet attempting to provide possible rationales for such a permanent decision. What do these things “mean”? The don’t have to mean anything, she says, but you should be careful about getting a tattoo whose meaning you will come to regret. She offers the experience of wanting to get a Linkin Park tattoo when she was 15 as the perfect example: something very deeply felt in the moment that would definitely be seen as a mistake with full hindsight. As a concept, Godzilla wandering the echelons of hell sits on the precarious lay line of madcap genius. It’s one of those ideas you need to embrace wholly in order to enjoy what comes after, and that acceptance is helped along a great deal by James Stokoe’s stellar opening issue of Godzilla In Hell (IDW). Godzilla’s fall is literal as he tumbles down into hell and warily sets forth to assess his new surroundings. His first act is to take umbrage with the towering “abandon all hope ye who enter here” monolith and atomic blast it to smithereens—how fun that hell has one of those, and that the King Of The Monsters can read it! The resulting dust cloud spells out “lust,” an indication that Godzilla has passed through limbo and—following Dante’s schoolings—is currently resident of the second level: lust. Lust is replete with endless violent winds inducing a restless state that purports to exacerbate carnal desires. Godzilla seems initially unaffected, but quickly grasps the danger and unease of the place as watchful red eyes blink at him from rocks and crevices. His explorations are interrupted by a humongous, approaching shape on the horizon: a hurricane of souls and debris that engulfs him, bringing him to his knees. But as he looks on, it takes shape into something new… another Godzilla! As fun as seeing Godzilla take on all comers in hell is, Stokoe’s approach is integral in making this work. The notion itself is bombastic enough, so other elements are pared back: it’s wordless, and Stokoe focuses on hell’s design and landscape and the creation of atmosphere to lend proceedings a sense of verisimilitude. It’s an achievement in itself to make Godzilla look small in relation to where he finds himself, but Stokoe pulls off that suggestion of vast scale and drama—silent and ominous. Stokoe reins in his more outlandish color palette for muted, fleshier pinks and earthy browns as the infernal engines smoke and churn, and he layers textured detail into the rocky plains. One of the most delightfully amusing things here is the manner in which Stokoe illustrates Godzilla’s face, eyes, and claws. The way in which he largely walks with arms and claws together instead of at his sides, like a bad villain contemplating his nefarious plans, adds to the humor in his characterization. He has a real depth of expression: at once malevolent and determined, and at times simply swaggeringly badass. There’s genuine shifts from suspicion, to new curiosity, to fury mode.